Greece, 1940. Not sunny vacation Greece: northern Greece, Macedonian Greece, Balkan Greece–the city of Salonika. In that ancient port, with its wharves and warehouses, dark lanes and Turkish mansions, brothels and tavernas, a tense political drama is being played out. On the northern border, the Greek army has blocked Mussolini’s invasion, pushing his divisions back to Albania–the first defeat suffered by the Nazis, who have conquered most of Europe. But Adolf Hitler cannot tolerate such freedom; the invasion is coming, it’s only a matter of time, and the people of Salonika can only watch and wait. At the center of this drama is Costa Zannis, a senior police official, head of an office that handles special “political” cases. 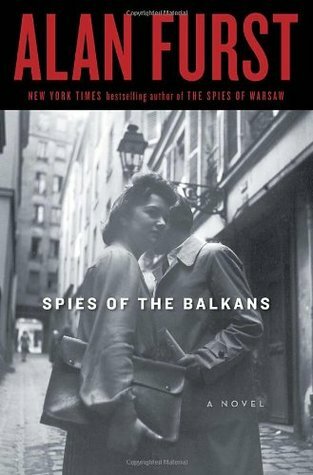 As war approaches, the spies begin to circle, from the Turkish legation to the German secret service. There’s a British travel writer, a Bulgarian undertaker, and more. Costa Zannis must deal with them all. And he is soon in the game, securing an escape route–from Berlin to Salonika, and then to a tenuous safety in Turkey, a route protected by German lawyers, Balkan detectives, and Hungarian gangsters. And hunted by the Gestapo. Half-baked at best, boring like hell at worst – that would be my summary of choice. This one didn’t work for me at all. Perhaps it’s a case of over-inflated expectations, perhaps the formula wore off, and small wonder, after 11 parts it’s hard to come up with something fresh. I am going to dissect the novel in the most cruel way but I promise I’ll be concise. The fate of Costa and his love interest, Demetria, failed to interest me because both these characters were as flat as a pancake. Well, even two pancakes. And a filling. I didn’t care about any particular Jewish refugee because the author didn’t give me an opportunity to do so. The plot was formulaic and very predictable, especially if you’ve read any of previous parts. It was soon deteriorating into an endless series of vaguely connected scenes with paper-thin heroes and heroines who did stuff. Even a daring escape from occupied Paris didn’t move me enough, it was so bland (and let me tell you, if an author botches up Paris there’s no hope). The proper research was there but I expect nothing less from such an experienced writer, specializing in the era so it is not a real asset. Don’t read this one, it’s not worth your effort. A major disappointment for me and a total failure. This entry was posted in a total failure, book review, historical, rating and tagged a total failure, Alan Furst, Greece, Hungary, IIWW, Nazis, Paris, series alert. Bookmark the permalink. That’s exactly my feeling. Apart from that, I think the series is already too long. Ugh it sounded good, but no thank you!